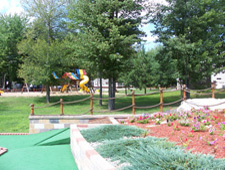 Saginaw Bay Resort offers a year-round pleasant family atmosphere. Located about 130 miles north of Detroit, this resort features spacious shaded sites and nature trails in an area boasting some of the best fishing and hunting in northern Michigan. At Saginaw Bay Resort, you can practice your swing at the practice tee or relax around the mini-lake, and you are only minutes from golf courses, amusement parks, marinas and beaches, factory outlet shopping, auto racing, and casinos. Amenities include general store, laundry facilities, small pond with beach, playground, picnic area, trails, firewood, adult lounge, clubhouse, pavilion, game room, indoor and outdoor heated pool, kiddie pool, hot tubs, fitness room, chapel in the woods, live entertainment.